This video, made by a Magic: The Gathering fansite, was meant to show you some of the cards available in an old 1993 starter pack for the game. 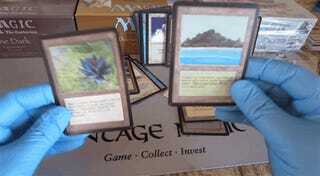 It was not meant to show you what happens when a grown man finds a Magic card inside it worth up to $30,000. As is explained at the start of the video, in these old alpha starter packs, the randomised "rare" card you'd receive was always at the "top", so the opener flips the deck so as to get to that one last. And when he gets there (at around 8:15), you can't blame his hands for shaking, just a little. To find a Black Lotus in one of these alpha decks - of which only 1100 were printed back in 1993 - is a rare and beautiful thing, with one of the unbalanced cards selling last year for just over $27,000. This one, freshly-opened and touched only by gloves, must surely be in the same ballpark. Here's a brief explainer on the alphas, the very first Magic cards you could ever get, if you're still wondering why all the fuss. UPDATE: Now that the dust has settled and the nerves have calmed, here's a better look at the card, which is now sealed away and awaiting grading.